Bordering the beautiful Tournament Players Club golf course designed by Tom Fazio, Murrells Inlet's master-planned community, Prince Creek basks in views of perfectly manicured greens, verdant lakes, ponds, and wooded groves of cypress, red oaks, and pines. Rich in indigenous wildlife and lush plants, residents live in harmony with egrets, swans, blue herons, otters, and other creatures. City life, great shopping, dining, the best schools, and the Grand Strand are just minutes away. Read more about Prince Creek real estate. A variety of distinct subdivisions features homes for every lifestyle and every budget. Some neighborhoods are on the golf course while some have picturesque water views. Some subdivisions are gated. You will find luxury mansions, a retirement community, incredible family homes, townhouses, and condos are all available in Prince Creek neighborhoods. The Bays are private gated communities that offer an array of choices. Residents have their own amenities such as a clubhouse, pool, and fitness room with baseball fields and soccer fields as well as basketball, volleyball, and tennis courts. There is also a beautiful outdoor fireplace and several outdoor fire pits. There are seven distinct neighborhoods, including Laurel Bay, Waverly Bay Willow Bay, and our favorite, Palm Bay - a lavish development with its own pool and clubhouse, as well as a park. Bellwood Landing is a gated new home community with many of the 102 home sites adjacent to natural conservation areas or with lake views. A number of homes offer direct access to the Intracoastal Waterway. Homes cost $200 to $600K. Hunters Grove is another gated new home community of 73 lots that sits just off Prince Creek Parkway. There are lots for sale to build your home and a few homes for sale for around the $200K range. They have their own community swimming pool. Collins Creek Landing is a gated subdivision with some homes having direct access to the Intracoastal Waterway. Prices run from $300 to 600K. The community has on-site boat storage. Creek Harbour, a gated neighborhood off Wilderness Road, offers elegant brick homes and lots as large as 3 acres. The community has on-site boat storage and some homes have direct access to the Intracoastal Waterway. Homes are priced at $400 to $900K. Linksbrook at Prince Creek is a Centex neighborhood with the option to purchase an available Centex home or choose one of the Centex floor plans and build a new home. Homes are 1800 to 2700 square feet in size. Linksbrook has its own pool, clubhouse and tennis courts. Creekhaven at Prince Creek West features homes constructed by Ryland Homes with lots and homes available for $200 to $300K. Seasons 55-Plus Adult community is a very popular gated neighborhood for active seniors. Elegant homes built with seniors on mind range from $150 to $400K provide wonderful amenities and communal activities to assure an active and social life for those 55 and older. The Garden Homes at Stonegate is another active adult neighborhood being developed. Condos are available at TPC Players Club Villas, Stonegate, and Cold Stream Cove. 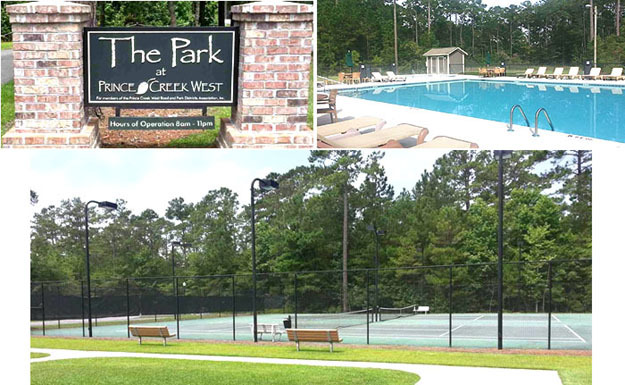 All the residents of the Prince Creek planned community enjoy the central Prince Creek amenities which include a clubhouse, fitness centers, pools, local gym access, and boating facilities. Grocery stores, a post office, and more are nearby. If you are considering a move or building a new home, there is much to consider at Prince Creek. Let us show everything this incredible community has to offer. Schedule a tour of the homes for sale in the Prince Creek Communities with one of our real estate professionals today.